Grouting and Ground Improvement is a 3.5 course that covers engineering,equipment, materials and methods for grouting and ground modification used in civil and geotechnical engineering, underground construction, tunneling and mining. Don’t miss this opportunity for professional development and high-level networking—all while earning CEUs! This course combines classroom instruction with hands-on lab sand demonstrations, providing participants with the opportunity to see grouting and ground improvement field equipment in action! This course is intended for industry professionals including owners,planners, designers,contractors,consultants and suppliers involved in the design,planning and construction of civil and geotechnical engineering,underground, tunneling and mining projects. Don’t miss this opportunity to network,learn and earn CEUs! 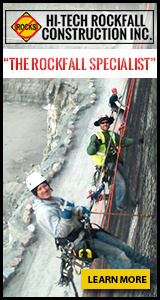 Colorado School of Mines will award 2.4 CEUs(continuing education units) upon successful completion of this course. Colorado School of Mines has along-standing tradition of hosting world-class short courses on our beautiful campus in scenic Golden, Colorado. 40 minutes/36 miles from Denver International Airport. Registration is open now! Space is limited! Early-bird and group discounts are available through March 15,2019.